October 20, 2016 (East Hanover, NJ) – Boxer Property is pleased to announce that Fishman McIntyre Berkeley P.C., a successful law firm, has chosen to renew and expand their office space at 120 Eagle Rock Avenue in East Hanover, New Jersey . Mr. Fishman’s practice first leased the space 20 years ago in this location. Since then, they have expanded 800 square feet to a total of 7,881 square feet to better accommodate several new partners at the firm. The executive offices at 120 Eagle Rock Avenue are part of the Eagle Rock Executive Park, a three-building complex located in the prestigious Morris County. This particular building boasts granite floors, a two-story atrium and a private pond with fountains. Recent upgrades have included state-of-the-art amenities, such as a new conference center, a fitness center and an enhanced deli. Boxer Property Leasing Agent, Rosemarie Heldmann, worked directly with the tenant to complete the deal. The ease of working with Boxer representatives was part of why Mr. Fishman’s firm chose to continue its expansion with Boxer. “Rosemarie is a pleasure to deal with and is very responsive if an issue comes up,” Mr. Fishman said. About Fishman McIntyre Berkeley P.C. Fishman McIntyre Berkeley P.C. represents clients across the United States and handles litigation in New Jersey and New York City. It has won several notable cases with respect to workplace injuries, general liabilities, insurance matters and more. 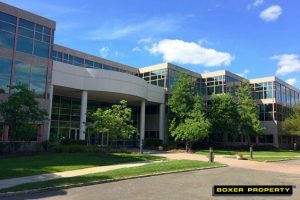 Founded in 1992, Boxer Property is a privately held firm that manages and leases office properties with over 18 million square feet across the nation with more than 120 locations. Boxer Property also administers retail, medical, and hospitality properties nationwide. Celebrating 24 years as a commercial real estate investment and management firm, Boxer Property specializes in increasing and maximizing the value of under-performing properties through aggressive hands-on management and leasing.